Posted September 11th, 2018 by Ms. Jen & filed under art + photography, nature + environment. 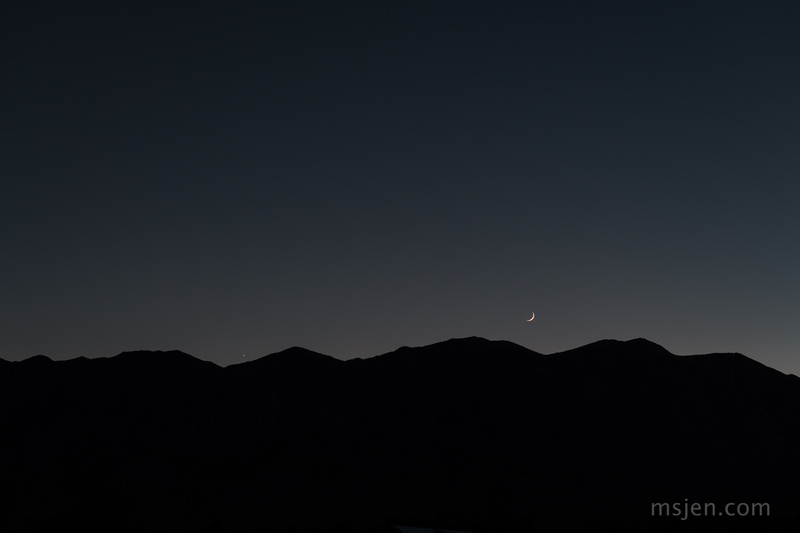 Tues. 09.11.18 – The beauty of Venus and the new Moon setting behind Wheeler Ridge, Eastern Sierra Nevada Mountains, California. Photo by Ms. Jen from the Sherwin grade view point on the northbound Hwy. 395 with her Nikon D850 and a 50mm lens. Posted August 14th, 2018 by Ms. Jen & filed under art + photography, nature + environment. 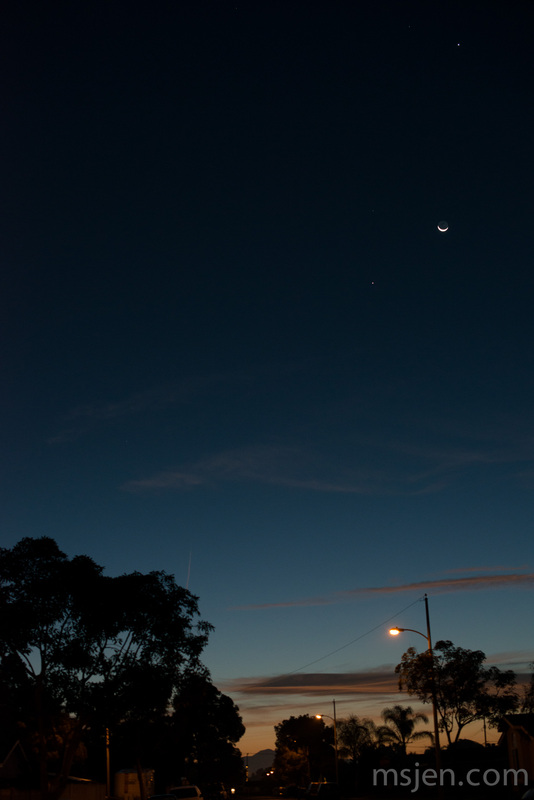 Tues. 08.14.18 – While the true August new moon was on Saturday the 11th, this evening was the visible separating conjunction of Venus and the three day old moon. It was lovely. Photo taken by Ms. Jen from the roof of her RV with her Nikon D850 and a Nikon 50mm f/1.4G lens. Posted February 28th, 2017 by Ms. Jen & filed under photos + text from the road. 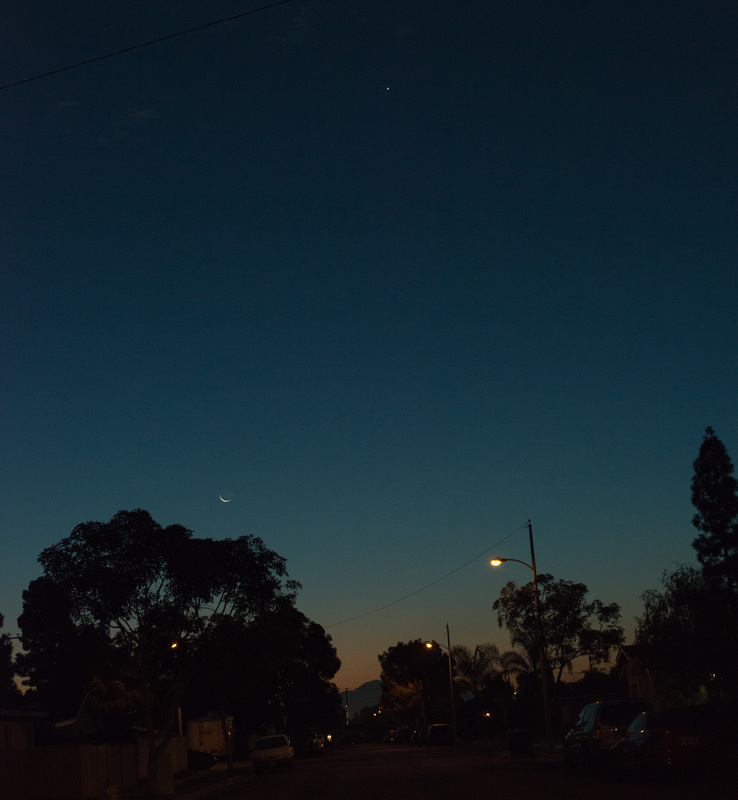 Tues. 02.28.17 – Last evening I went out to my photography corner of Brockman Lane and Dixon Lane*, so that I could take photos of the New Moon as it set behind Mt. Tom to the west. 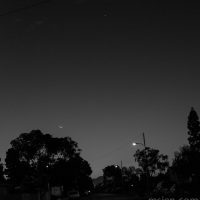 I used the US Navy Observatory Moon rise and set calculator to figure out when it would set and when civil twilight would be so I could take the above new moon photo and attempt to take a photo of the Mars & Uranus conjunction. When I drove out at 6:30pm, it was approximately 42F / 5.5C and there were frogs singing their little hearts out. Odd but true. Frogs trying to get laid in February when it is still dipping below 32F / 0C at night. By the time I finished nearly 40 minutes later, it was at least 5 degrees colder, a wind had picked up, and the frogs had wisely retreated. My gloves** were not equal to the task at hand and my fingers were sending mayday alerts. 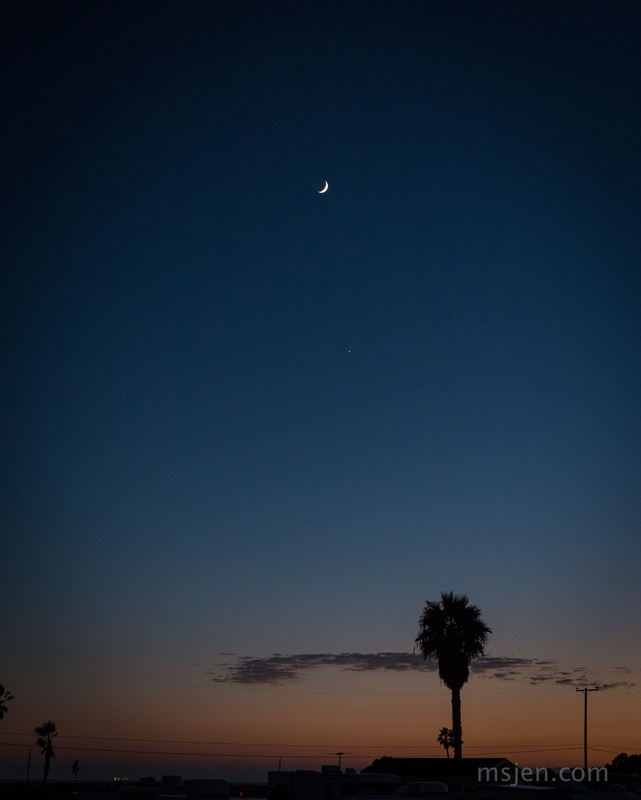 The good news is that I was able to take a series of photos of the Moon and Venus (Instagram), the Moon setting behind Mt. Tom (Flickr), three photos of Mars & Uranus. Why no posted photos of Mars & Uranus with the used Nikon 70-200mm f4 lens taken with my Nikon D800? Post-processing is my achilles heel. I love to shoot, but I hate post-processing. Working in Lightroom and Photoshop bring out the worst of my personality and work habits. I am normally a patient person who can spend hours crafting a thing, but not in photo post-processing. 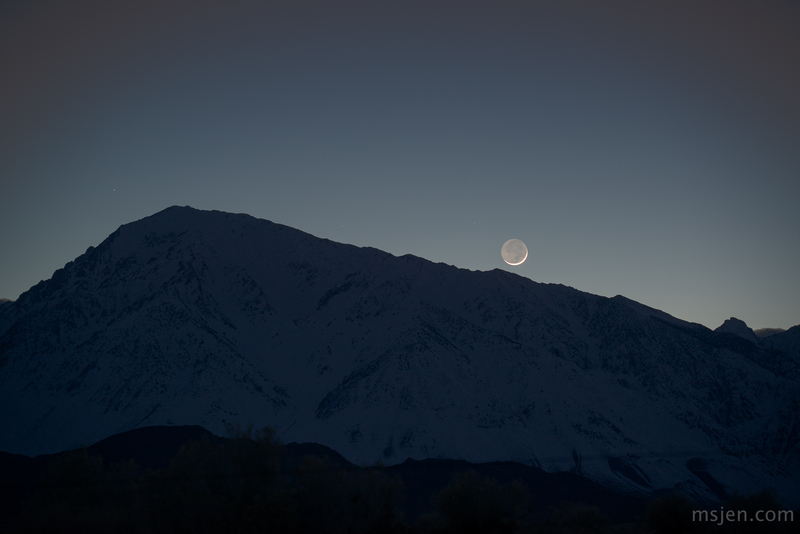 Last night, the Flickr version of the Moon Setting on Mt. Tom was my favorite of the three photos I took within a minute and then processed the RAW files to jpg. This morning, the photo I posted above is my favorite. But the truth of the matter is that only the Instagram photo that I took with my camera phone captured the color of the late dusk sky correctly. 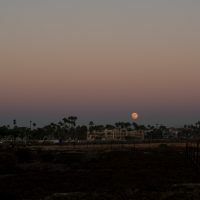 No matter how I fiddled in Lightroom last night, I could not get the RAW files to have the right two tones of the late dusk sky. I had to resort to using split tone highlights and shadows – this feels like it is too much processing. But that is the point of shooting RAW, I get to do my own processing and not let the camera generate the jpg. Anywhoo, forgive my grousing. If you have a clear horizon, do go look at the new moon as it sets tonight. 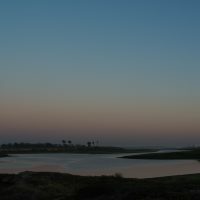 Astro Bob has a nice blog post on the new moon for the 27th & 28th of February, as well as how to find Mars & Uranus with binoculars. *Do you all sense a theme here? Local high point with low sagebrsuh so the view of the Eastern Sierra, the White Mtns., and the Owens Valley is good. 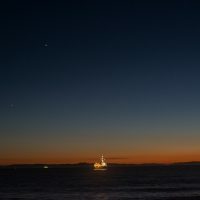 ** I wonder how my Finnish photo friends shoot at night and dawn in winter with a tripod? I must inquire what gloves they use that allow for dexterity & flexibility but keep one’s hands warm. Posted November 13th, 2016 by Ms. Jen & filed under art + photography, nature + environment. 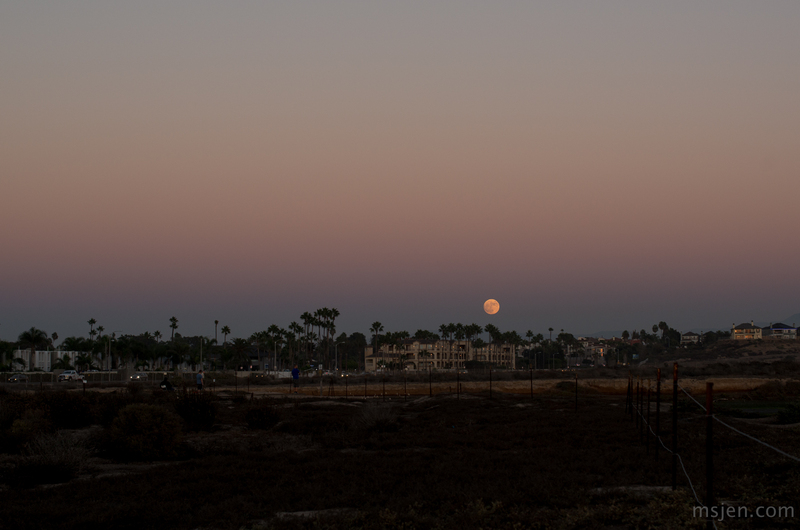 Sun 11.13.16 – Late this afternoon, I drove down to the Bolsa Chica Ecological Reserve Station at the corner of Bolsa Chica Ave and Pacific Coast Highway to take photos of the Almost Super Moon as it rose in the late 4 o’clock hour. 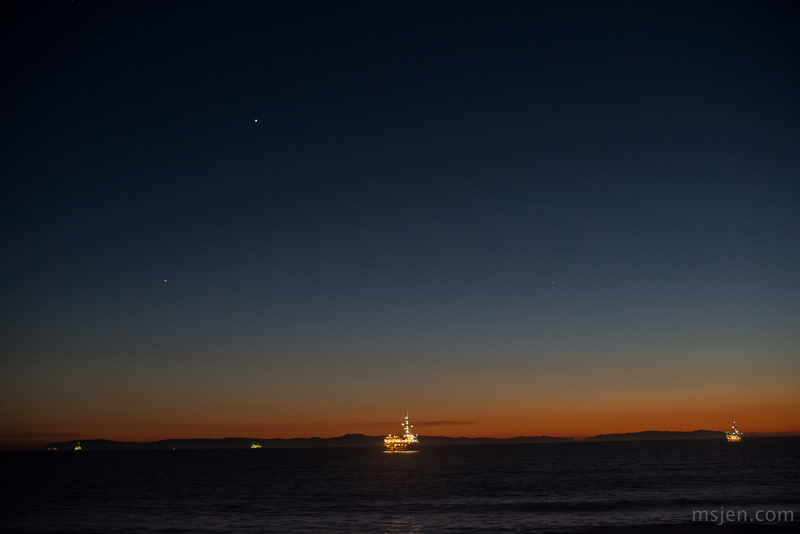 After all the photos were taken, I drove to the Huntington Cliffs parking lot at the top of Dog Beach to take photos of Mars, Venus, and Mercury in the last of the dusk. Afterwards, I walked Belle le Cane along the Cliffs. It was a lovely start to the evening. All photos taken by Ms. Jen with her Nikon D800 and a Nikon 50mm f/1.4G lens. Please double click on the thumbnails for the larger lightbox gallery. Posted October 9th, 2015 by Ms. Jen & filed under art + photography, nature + environment. Fri 10.09.15 – Yesterday morning we had a pre-dawn cloudy conjunction of the waning crescent moon with Venus, this morning’s pre-dawn show was the Moon in a triangle with Mars and Jupiter. Posted September 11th, 2015 by Ms. Jen & filed under art + photography, nature + environment. Fri. 09.11.15 – Due to the hot, humid, sub-tropical September (*evil*) weather we have been having here at Black Phoebe Central wherein it is nearly 80F by 7:45am, I have been taking the dogs out for their morning constitutional around 6am. 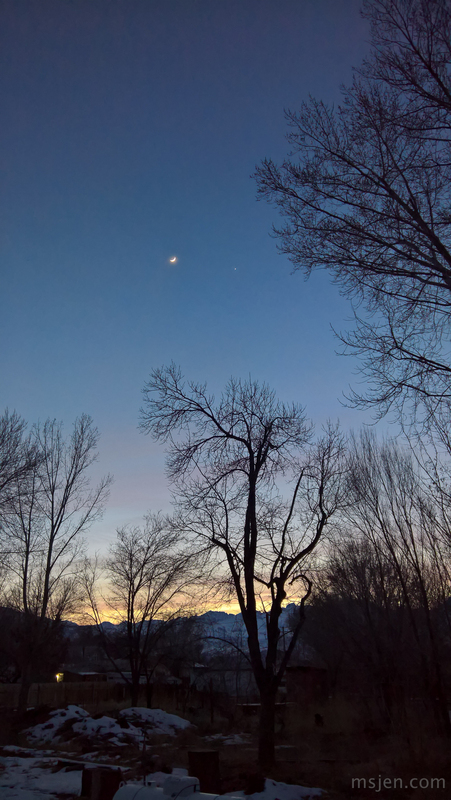 This morning, Belle needed to go out for a pitstop about 10 minutes before 6am, as I was outside looking east into the first colorings of twilight dawning in the sky with a lovely waning crescent moon and Venus, I ran back inside to get my Nikon D800 to photograph the scene. I liked the resultant photos but did not post them at Flickr or the Instragrams, until this afternoon when I wondered how converting the photo to black-and-white in Lightroom would improve the photo or not. I used the Lightroom B&W 5 preset with a few changes in exposure and was very happy. I posted the B&W version to the Instagrams to as much fanfare as my IG stream every really produces and then wanted to show both photos side by side here to see what you all think. Click on the thumbnails for the medium and large views of the photos. 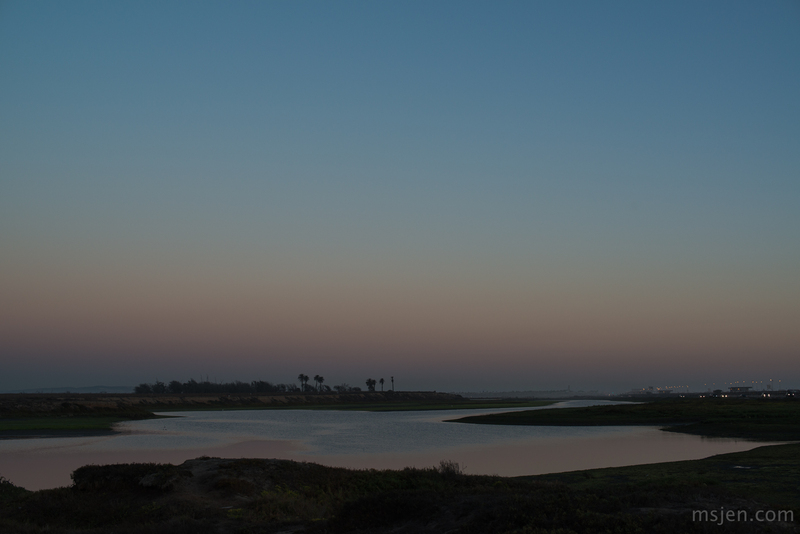 Do you prefer the colors of the pre-dawn sky or is the B&W version more intriguing to you? Posted July 17th, 2015 by Ms. Jen & filed under nature + environment, photos + text from the road. 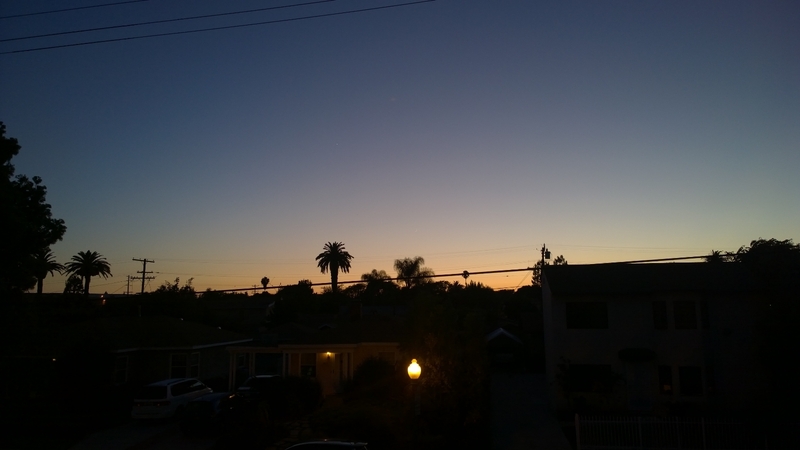 07.17.15 – The crescent moon is very low on the horizon just above the queen palm trees in the center right of the photo, click on the image for the larger version to see the details. Photo taken by Ms. Jen with her Nokia Lumia 1020.